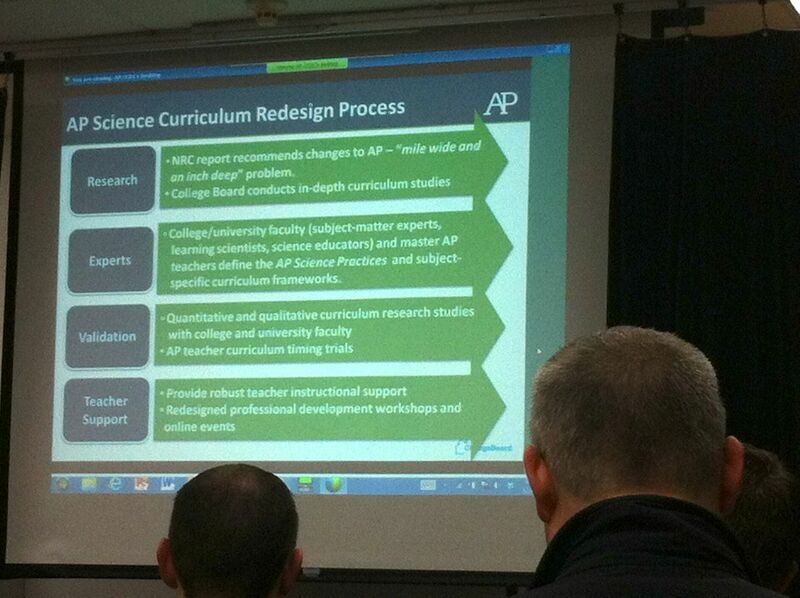 Today I missed class to attend the annual AP Science Symposium posted by Hinsdale Central High School. I’ve attended the symposium for several years and always look forward to it. The day is mostly unstructured and provides an opportunity for AP science teachers to discuss topics of interest. This year, we physics teachers focused primarily on the new AP Physics 1/2 courses and a bit about Next Generation Science Standards. Lots of discussion about Modeling Instruction (especially for this crowd). I snapped a photo about why the College Board is revising so many AP science courses and I may share it on Monday when we start discussing NGSS. Every year I feel that I share something that will help other teachers, and I leave with something new that they have shared with me. That’s the best kind of professional development.